Visit our Google, Facebook, and Houzz Pages to see hundreds of reviews and project photo albums of our work and transformation we create! It’s natural to ask, “what’s your price?”; a better question, “what do I get for that price?” The problem with “price shopping” is those who quote cheap prices are forced to cut corners everywhere and are responsible for most of the nightmares in our industry. Get in touch with us today, and put our expertise, knowledge, and reputation to work for you. Cabinetry Refinishing of Birmingham and Huntsville Alabama are owned and operated by the Salter Family. Bob Salter and his son Paul Salter run the locations together. 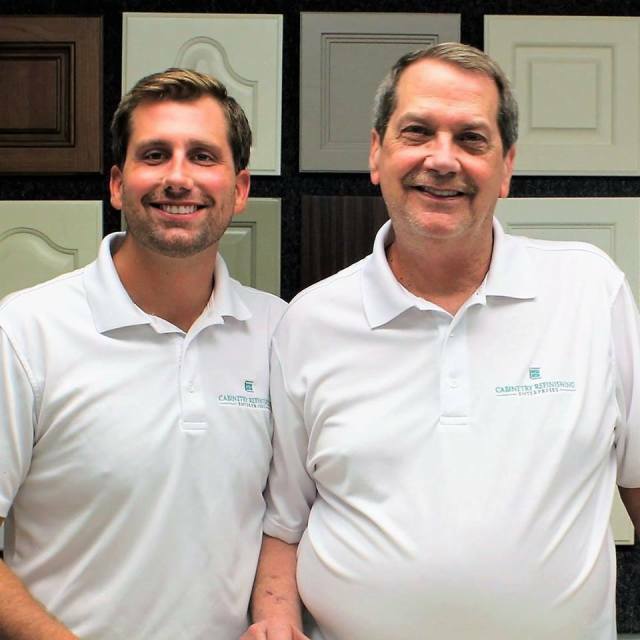 Bob Salter’s wife, Dayton began the business in the early-90’s in Birmingham as an outgrowth of her decorative painting company, Faux Impressions. As the business grew, Dayton enlisted her husband Bob to help with the expansion. Bob took a leave of absence from his current job to join the growing business, and never looked back. Before long, Paul got involved in the business, working through high school and into his college years. Paul graduated from the University of Alabama Business School with the goal of expanding the company regionally.